Canned tuna is cheap, but often of inferior quality. The tuna is dry and tastes mostly of salt. I have found good quality ‘organic’ canned tuna from the Ortiz brand, but that is more expensive than sashimi grade fresh tuna. So when I read about tuna cooked sous-vide with olive oil at 71ºC/160ºF for an hour as a tasty alternative for canned tuna on SVKitchen.com, my interest was piqued and I decided to give this a try. As the tuna will be pasteurized with this cooking time and temperature, it is perfectly fine to use frozen tuna for this that is a lot cheaper than sushi grade fresh tuna. I’ve used the cooking time and temperature as determined experimentally by SVKitchen — I didn’t see the need to perform my own experiments this time around. SVKitchen adds preserved lemon, which I don’t have and decided to replace with simply lemon zest. I was quite happy with the result. The cooking time and temperature will turn a piece of tuna into something that closely resembles canned tuna in texture and color, only more succulent and flavorful. The tuna will definitely be ‘well done’, not ‘medium rare’ at all as is usually the aim of sous-vide cooking. I prefer fresh tuna to be eaten raw or only seared, but this is certainly a good alternative for canned tuna if that is called for in a recipe. Especially in recipes where the tuna stands out (such as a Niçoise salad), it is worth using sous-vide tuna confit rather than canned tuna. I haven’t tried this side by side, but from memory I’d say it’s also better than Ortiz. 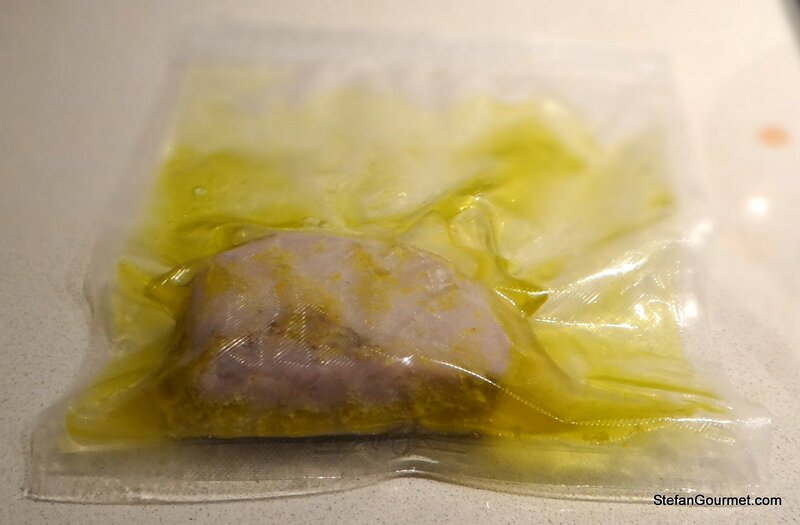 Combine the tuna with the salt, lemon zest, and olive oil in a sous-vide bag. This needs to be a ziploc bag unless you have a chamber vacuum sealer. 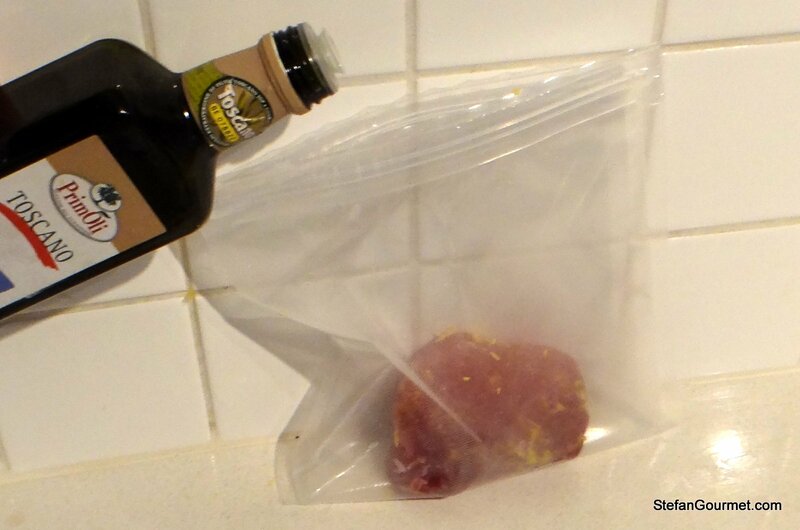 Vacuum seal the tuna with a chamber vacuum sealer, or close the ziploc bag with as little air as possible by submerging it in water. Cook sous-vide for 1 hour at 71ºC/160ºF and allow to cool. Serve with the olive oil from the bag if desired. Very intriguing. But I just have to ask… wouldn’t you rather have some wonderfully seared tuna then canned tuna-like tune? I know it has its place – I’ve even done a post on pasta with tuna – the good, expensive kind to which you referred. But I think I’d prefer any tuna as is. Just wondering! In most cases I would indeed go for the seared tuna. 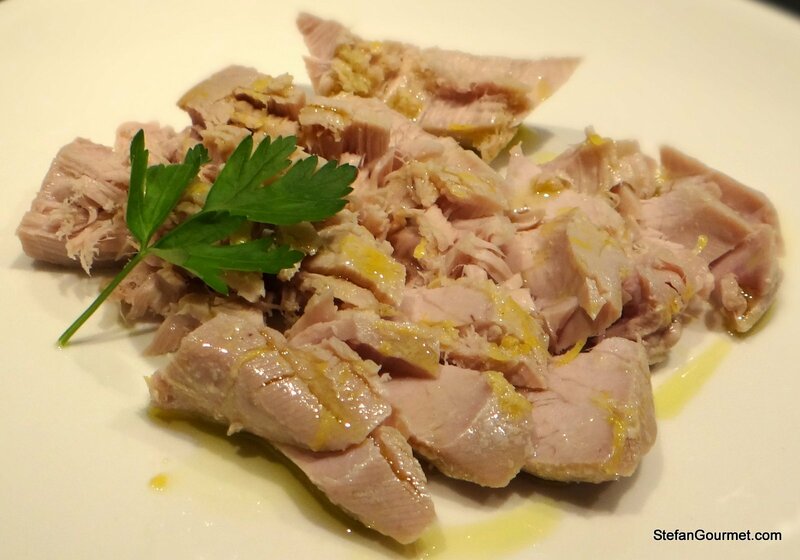 The point of my post is that for recipes where canned tuna is called for (such as vitello tonnato), making your own tuna confit may be cheaper and tastier than using the expensive canned variety. So it is cheaper? That’s what I was wondering. I’ve purchased the tuna belly before – really good but very expensive if you need a substantial amount! Overhere the Ortiz canned tuna is 3.95 euros (US$ 5.25) for about 1/4 lb of tuna. A lb of sashimi grade tuna is about 16 euros (US$ 21), so the price is about the same as Ortiz canned tuna. A lb of frozen tuna however is less than 6 euros (US$ 8), so making my own tuna confit would cost me only 1.50 euros (US$ 2) compared to 3.95 (US$ 5.25) for a can of Ortiz. This is even a bit cheaper than regular canned tuna in olive oil from the supermarket! Of course prices may be different in your area. I fish for Tuna, I see what is on them, WELL DONE I’m cooking it !!!!!!! “The cooking time and temperature will turn a piece of tuna into something that closely resembles canned tuna in texture and color, only more succulent and flavorful.” This sounds lovely – especially if you have a variety of tuna that might not be ideal for a medium-rare preparation. You are right, this would be sumptuous on a Niçoise salad (on of my favorite salads!) in place of dry, canned tuna. 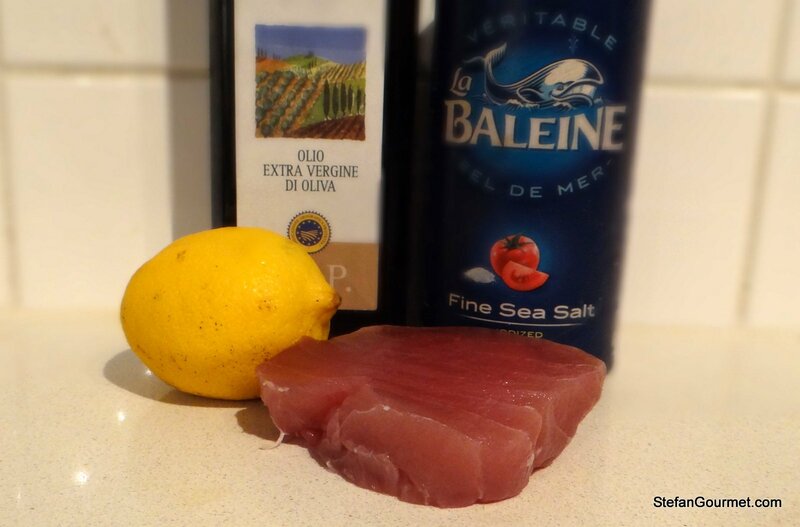 Oh, and the lemon and olive oil combination with the tuna is fresh, aromatic and mouth-watering. Thank you for sharing with us. You are a food adventurer. 🙂 Have a great weekend, Stefan. Thanks, Shanna. I hope you’ll have a great weekend, too! OH. THAT is a GREAT idea. I have a candy thermometer that would work perfectly! You know, I often come across wild, previously frozen tuna. We are in the desert and land-locked, so fresh fish is hard to come by. This would be an ideal preparation for my less-desirable tuna! Thank you! I do love Niçoise. 🙂 Take care! I think this preparation method is also known as oil poaching. 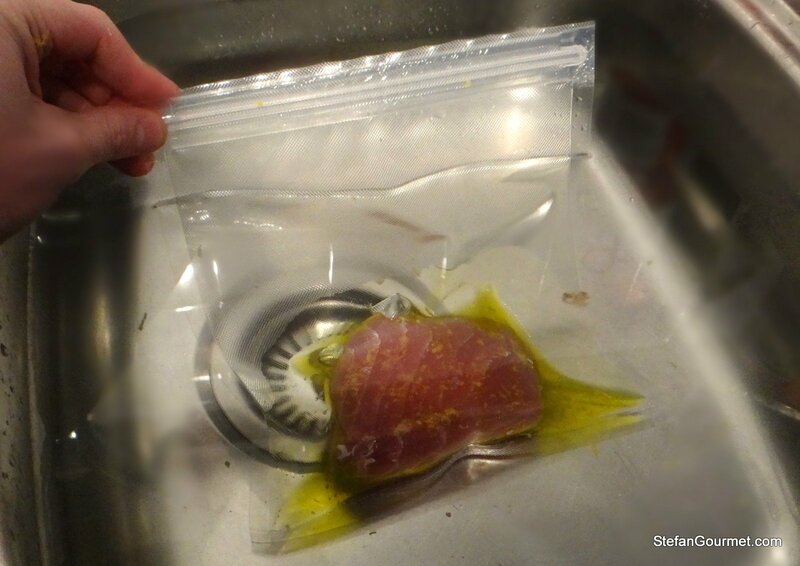 It’s especially suitable for sous-vide as it doesn’t take a whole pan full of oil, just enough for the fish in a bag. I’ve done a version with salmon, dill and liquid smoke, albeit cooked at lower temperature. Works a treat, every time. Oil poaching would indeed be an appropriate term. Your salmon version sounds great. Hi Niels, thanks for the nice idea. I bet using that oil together with the tuna confit will make for a great sauce for vitello tonnato. intriguing but I’m not sure about this one, Stefan. I actually like canned tuna in certain preparations but Baby Lady is allergic to it. As such, even if it was not canned tuna, if it resembled canned tuna, she won’t eat it. (It’s kinda like she doesn’t like carrots; ergo, parsnips are bad, too.) On the other hand, she loves fresh tuna. I would think frozen tuna cooked medium/medium rare would be preferable to overcooked poached tuna. Then again, I do use duck breasts to make some of the best pastrami you will ever eat. I’m definitely going to have to think on this one. I agree with you 100% that tuna cooked medium/medium rare is preferable to overcooked poached tuna. There are just some recipes where canned tuna is preferred (like vitello tonnato or spaghetti al tonno). Of course if Baby Lady doesn’t like it, then I guess you won’t be making it much.